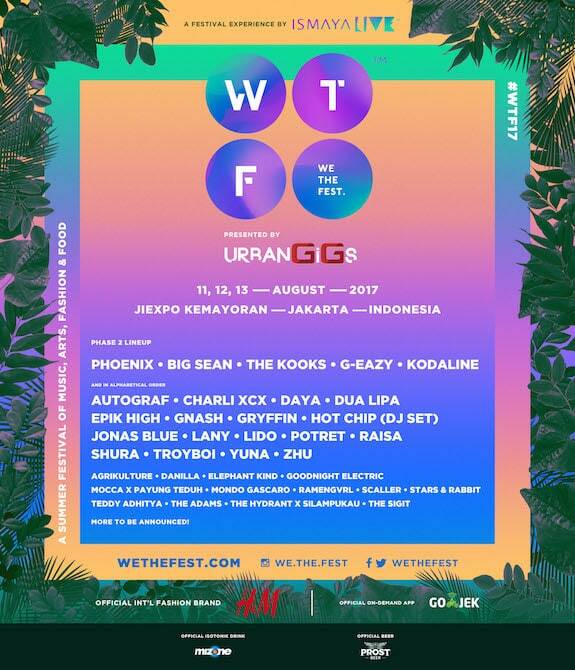 Indonesia’s hottest new festival, We The Fest (WTF), have released their Phase 2 lineup. Taking place at a new 45,000+ capacity exhibition centre (JIEXPO Kemayoran), the venue will play host to handpicked talent from countless countries and genres, making this year's acts at WTF the most eclectic to date. Names already featuring on the billing include Grammy-award winning synth-pop group Phoenix, indie-electro trio Autograf, People's Choice winner G-Eazy, and pop sensation Dua Lipa, who will all showcase their electrifying sets to local and international fans. English singer-songwriter Shura, and regional talent Yuna, will also be gracing the event with their signature styles. Phase 2 now brings even more additions to the already stacked line-up, including hip hop royalty and Kanye West protégé Big Sean, UK indie mainstays The Kooks, and Irish rockers, Kodaline. Grammy and Mercury-nominated duo Hot Chip will be taking to the decks to play one of their world famous DJ sets, while, flying the flag for electro-pop, is Charli XCX, whose quick rise to international stardom and multiple top ten singles make her a must-see at this year's event. Other notable names in the mix include Gryffin, Troyboi, Zhu, Epik High and Lany who will bring a combination of rock, hip-hop, and dance to the JIEXPO Kemayoran centre. We The Fest has become renowned for spending as much effort on well-curated musical line-ups as they are on other essential parts to the festival experience, such as arts, fashion and food. Last year saw 5-star chef masterclass sessions, bubbling artisan street food stalls and fashion pop ups, and this year will be no different, with H&M returning as the official fashion brand and Urban GiGs as the official presenting partner, as well as the welcome return of WTF's famous Eats & Beats stall by Ismaya Food Town.